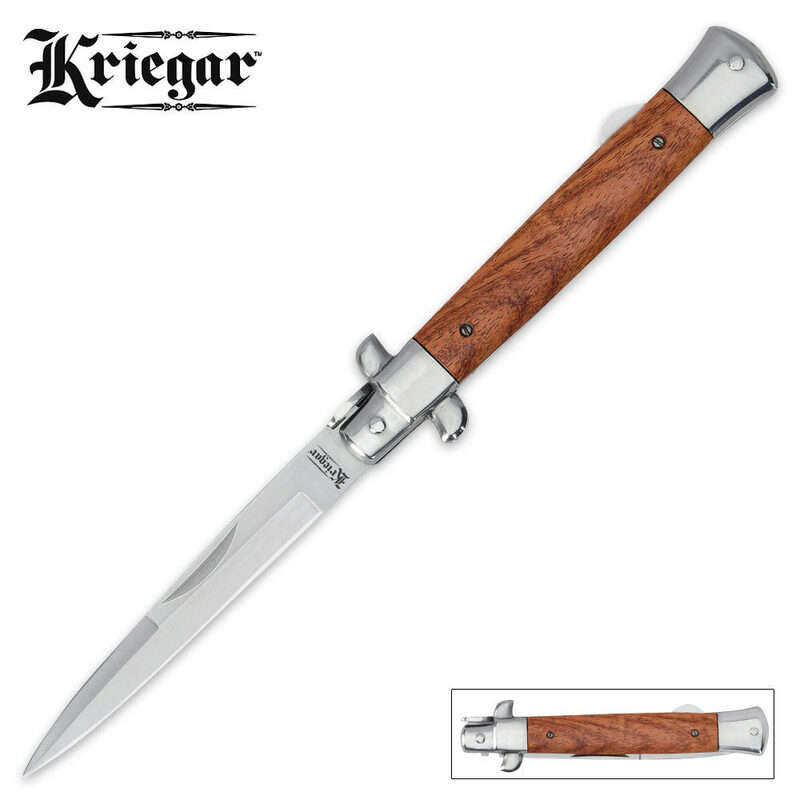 Kriegar German Heartwood Stiletto Pocket Knife | BUDK.com - Knives & Swords At The Lowest Prices! Enjoy Kriegar's classic styling and quality in this all new Kriegar stiletto. 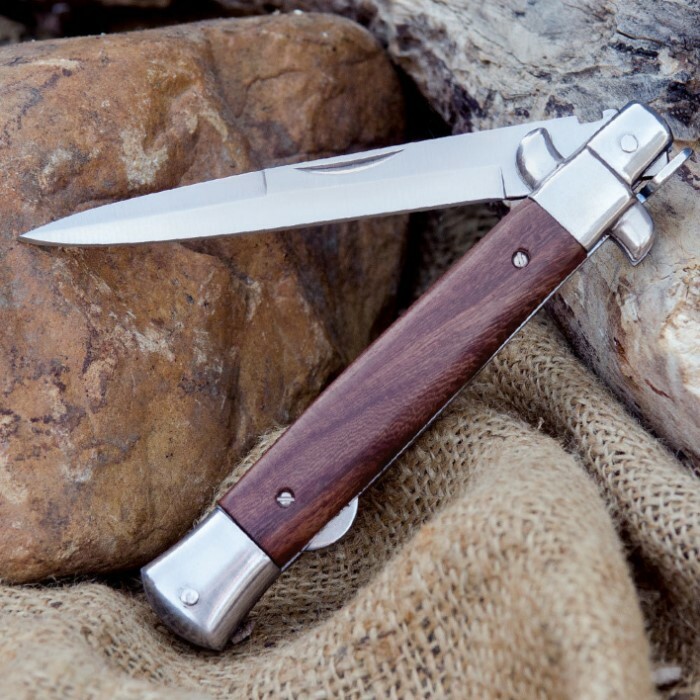 It's the perfect gentleman's knife! Each stiletto features a stainless steel blade with a razor sharp point and a gorgeous heartwood handle. Very well built beautiful knife ! I will buy more this is a can’t miss deal ! AWESOME DEAL, buy, you won't regret it. Excellent value. Very nice knife. Wood scales are finished very well, no chips, scratches, etc. Blade is brushed finish not "mirror polished" as stated . It looks nice and has no blemishes. End sides of liners should have been polished or at least have the saw appearance ground finer. The scales are screwed on so I can remove them an finish the front and rear of the liners. I am just picky that way. My knife was very hard to unlock. I have been using mine well over a year and it is still tight and holds a great edge. It readily slices anything I have put it too from cardboard to hunks of meat. It is better than other stiletto's I have bought at 3 times the price. For grins I sharpened the false edge and now it rocks. This has got to be the BEST BUY on BUDK! A very high quality knife. Nice weight, flawless construction, beautiful stiletto blade. 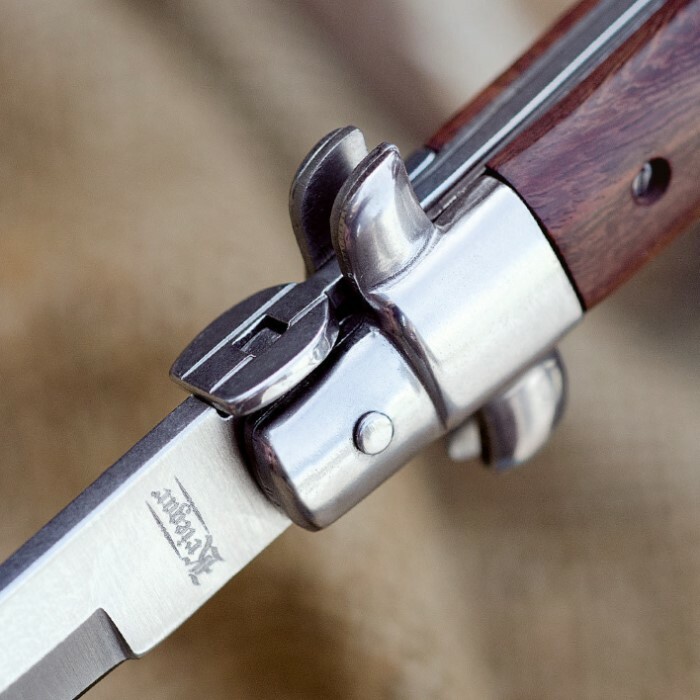 Be advised that it is a finger notch, manual opening, lockback knife. If it was a spring assist, it would be a $100.+ knife. Buy it! Thought maybe it was an assisted opening when I saw it. After getting it, I don't care. Beautiful finish and fit. Nothing loose. Blade was almost razor sharp. A very sleek and classy knife. I got mine today and I am very pleased with it. Beautiful knife and does not feel cheap as I thought it would for the price its very well worth it. One thing i suggest is putting in the description that it's manual even tho I was aware but it makes people assume it's spring assisted since it does not say. Worth 4 times the price...maybe I got lucky (I doubt it), but this is the TIGHTEST locking knife I've held for under $150.Thanks!